The Hoops celebrated 6th win of the season beating UBUMWE BBC 69-48. Rosine Micomyiza (G-95) top-scored for the winners with 17 points and Faustine Mwizerwa (01) nailed 15. KAMANA Aisha and Marie Chantal UTAMULIZA replied with 11 points each in a loss. IPRC-South is second with a 5-1 record, while APR BBC is third with a 4-3 record. IPRC-South edged UR BBC Women 88-46, while APR BBC beat Groups Scolaire Marie Reine Rwaza 101-46. The local basketball governing body (Ferwaba) will be organizing the second edition of Women's Day Tournament this year. The week-long competition is scheduled for March 2-9 in Kigali, Times Sport has learned. Teams will compete under three different sections namely; the top level category (for league teams), the youth category (for secondary schools) and the veterans fray. Four teams have confirmed their participation in youth category where Gashora Girls School will vie with Lycee Notre Dame de Citeaux for the ticket to the final, while ENPD Karubanda and ES Kamonyi will meet in the other clash for final berth. In the league teams' category, it will be a contest for five teams where they have been grouped into two pools. Holders IPRC-South, The Hoops Rwanda and GS Marie Reine make Group A whilst Group B includes APR and Ubumwe. In veterans section, Ferwaba team has been pitted against Shooting Touch, while REG will be up against RSSB. Winners from both encounters will meet in the final. All games will be played at Amahoro indoor stadium, in Remera. THE HOOPS RWANDA WOMEN BASKETBALL CLUB coach Eric Dusabimana has said that their target is to win the league title after thrashing Ubumwe Women Basketball 72-28 to move into third place in the Bank of Kigali Basketball League. "This is our second win in three league games and this means we are title contenders," he said. New signing Joyeuse Sifa Ineza posted a game-high 20 points while her teammate and captain Hope Butera (01) contributed 15 points. Butera also recorded 10 rebounds. 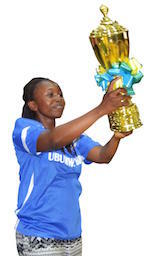 Ange Nelly Irakoze was the highest scorer for Ubumwe with six points followed by Redempta Uwamahirwe and Shaban Rehema with four points for each. The Hoops are one point behind leaders IPRC-Kigali who have six points from three games. Meanwhile, Espoir beat IPRC-Kigali 73-59 on Friday in the last match of the first round of the basketball league. They remain in third place.